Happy Friday! This week my little munchkin and I have been battling a cold so I couldn't be happier that the weekend is finally on the horizon. The one thing that made my week a little brighter was the arrival of some SheInside pieces. SheInside were kind enough to send me their charming black heart studded earrings and lovely black leaves scalable tie necklace, which is even more beautiful in person and definitely a stand-out of piece! Both pieces are so versatile and can be worn with a variety of outfits. I couldn't be happier! They will definitely be getting plenty of use in my closet. Now it's your turn to get in on the fun! 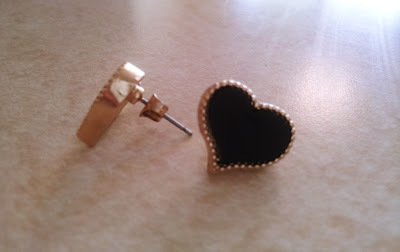 SheInside is graciously giving TWO readers a $50 coupon code to their site, a heart necklace, plus a secret gift as well! Remember each one counts as a different entry so be sure to enter them separately. You may tweet once a day if you'd like, but be sure to leave comment on post about your re-tweets. Giveaway ends October 1st . A winner will be selected by random.org and will be notified via email. UPDATE: Congratulations to keonte dot smith @ gmail dot com and samantha.tedesco@gmail.com you won!! I will contact you both shortly. I love all their items!!! I would love to win the gift card to spend it on---http://www.sheinside.com/Orange-Lapel-Long-Sleeve-Zipper-PU-Leather-Coat-p-99314-cat-1735.html I need a new coat!!.. Like u on fb and left comment. i'm anne dall on fb. At the end I follow you on Pinterest! I registered (keonte dot smith @ gmail dot com). I would definitely buy one of their maxi dresses. They are comfortable and stylish. So many cute things! But I'd probably buy a handbag if I won. Thanks!